The Cheltenham Gold Cup is the highlight of the festival meeting and takes place on Friday afternoon at 3.20. It features an intriguing clash between last year’s winner Bobs Worth and Silviniaco Conti who fell at the third last when travelling well last year. The Favourite is Bobs Worth who battled on bravely last year to beat Sir Des Champs. The runner-up is missing through injury this time but fourth home The Giant Bolster is back for another try. Nicky Henderson has been pleased with the preparation for Bobs Worth this year, winning the Lexus Chase impressively in Ireland. He has won at each of the last three Cheltenham festival meetings and jockey Barry Geraghty is riding on the crest of a wave after wins in the Champion Hurdle and World Hurdle. 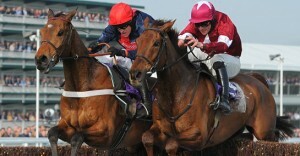 His big market rival is Silviniaco Conti who would almost certainly have given him a race had he not fallen last year. He appeared to be full of running in the hands of Ruby Walsh when falling three from home. He finished ahead of Bobs Worth at Haydock on his first start of the season and then won the King George VI Chase at Kempton on Boxing Day. It was stamina that won the race that day as he caught the front-running Cue Card. Noel Fehily takes the ride this year and it will be interesting to see if he decides to keep him up with the pace on this quicker ground. Bobs Worth is the current favourite with Bet365. The big market movers in recent weeks have been Irish raider Last Instalment and Grand National hope Triolo D’Alene. Last Instalment would really have preferred softer ground and there must be concerns after his history of leg problems. Triolo D’Alene was a largely unconsidered 40-1 outsider a few weeks ago but the booking of champion jockey Tony McCoy has brought him into 10-1. He won the Hennessy Gold Cup at Newbury back in November but will need to improve by around a stone to get close to his stable companion Bobs Worth. First Lieutenant has more chance of staying this trip on good ground. He was disappointing behind Last Instalment recently but has each-way claims. On His Own was supplemented at the cost of £27,500 for this race after two successive victories. He was originally thought to be on target for the Grand National but trainer Willie Mullins feels that he is entitled to a shot at this race. The Giant Bolster has twice been placed in the Gold Cup and returned to winning ways last time out. He wore blinkers and a hood that day and connections hope that the transformation was not only temporary. Grand National favourite Teaforthree may be the best of the outsiders after a fine run at Ascot last month.